This is one of my recent White Wedding Cakes with a gorgeous spray of Closed Peonies from buds to full blooms and my exotic Freesia. It’s a white on white and so difficult to get a good picture. 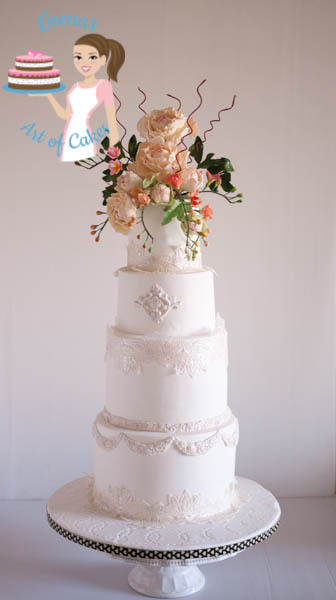 I love working with white wedding cakes. There is something about them, isn’t it? I love the lace and so wish you could see the pattern better. 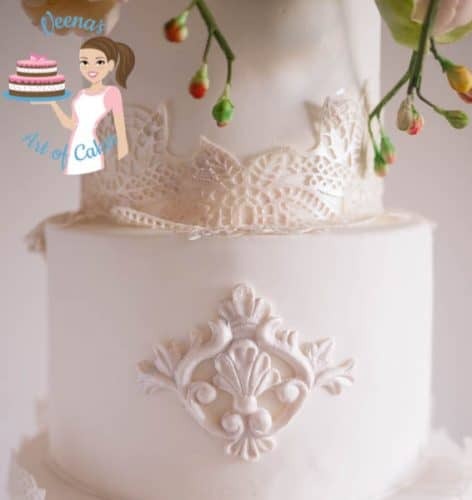 This is the Homemade Edible Lace Recipe I used. I see some of you are having great success with it so far. The cake flavors are my Classic Vanilla Cake and Classic Chocolate Cake both these will soon be uploaded in my Calculated Recipe collection. I hope you will enjoy this cake. In fact, I was so excited about this recipe I had to make a video to ensure you get it right. 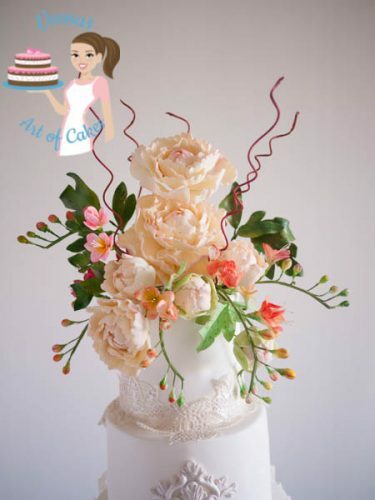 Remember you can get my Free Cake Recipes in this blog as well as some calculate Recipe collections in my online shop. These are calculated from 6-inch to 14-in round and 6 to 12 inch Square. I have now been using Satin Ice more often but you could use my Homemade Fondant Recipe too. Works just as well. Of course, the rest of it is molds – I love molds and I must admit I have a huge collection of molds. I do share some of my favorite ones here on my page ‘Tools of the Trade” which I see some of you are using as a reference.